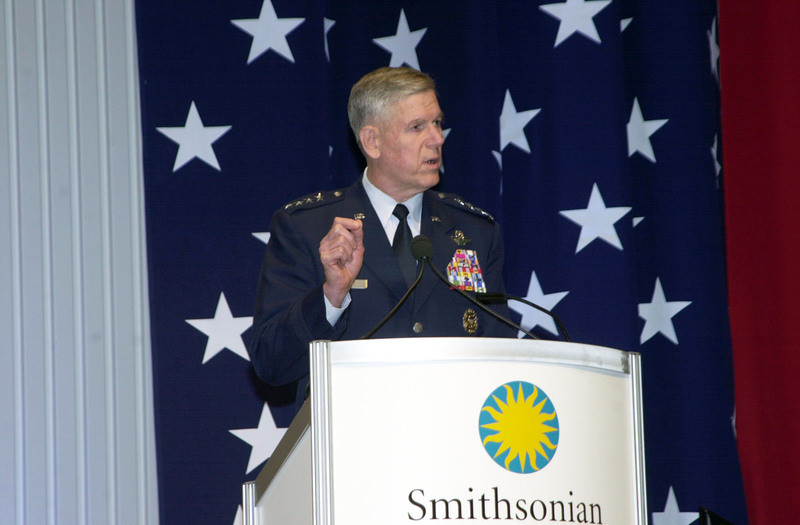 CHANTILLY, Va. (Dec. 11, 2003) -- One of the most popular museums of the Smithsonian Institution here celebrated its expansion with a day honoring military aviation veterans. Military aviators from conflicts as far back as World War II were invited to the "Salute to Military Aviation Veterans" Dec. 9, at the National Air and Space Museum's new Steven F. Udvar-Hazy Center. The center is located in Chantilly Va., less than 30 miles from the museum's flagship building in Washington. Chairman of the Joint Chiefs of Staff Gen. Richard B. Myers addressed nearly 4,000 military aviation veterans, family members and attendees at the Salute to Military Aviation Veterans event. The salute took place at the National Air and Space Museum's new Steven F. Udvar-Hazy Center here. The chairman of the joint chiefs of staff, Gen. Richard B. Myers, addressed event attendees. "For a century, America's aviation veterans have bravely explored and expanded the limits of air power," Myers said. "They made America an air power -- the most innovative and respected in the world today." Examples of that air power, both old and new, were on display. Among the 82 aircraft shown were the B-29 Superfortress “Enola Gay,” the space shuttle Enterprise, an SR-71 Blackbird, a test model of the Joint Strike Fighter and the Concorde. The aviation hangar at the heart of the center is nearly 10 stories tall and the length of three football fields. Aircraft are displayed at floor level and suspended from the ceiling at various heights. Visitors can view the collection from the floor or any of several catwalks that crisscross the hangar. Eventually, the center will house 200 aircraft, 135 space artifacts and thousands of smaller aviation-related items. Nearly 80 percent of the air and space museum's aircraft will be put on display at the center. Some World War II aviation veterans in attendance were amazed at the array of aircraft on display and said they enjoyed the opportunity to revisit the aircraft they had flown nearly 60 years before. Retired Lt. Col. Milton W. Sanders joined the Army Air Corps in 1941 and flew 116 missions over Europe. He has 8,000 career flying hours, with more than 1,000 in the P-47. He said he was amazed at the size of the center. "This is fantastic," Sanders said. "It's going to take you a week to really go through the place." Sanders, now 86 and in a wheelchair, was accompanied by his son and granddaughter. He took them to see the P-47D Thunderbolt. "The P-47 was the most fantastic aircraft the Air Force ever had," he said. Sanders said he remembers a mission he flew in the P-47 near the Loire River in southern France. "About 20,000 soldiers from the German army were on foot coming from Italy back to Germany," he said. "It was our job to suppress them." Under the barrage of artillery the P-47 threw down, it did not take long for the Germans to surrender, he said. "That was the first time an army of that size surrendered to air power alone," Sanders said. George Baker served in the Army Air Corps in the Pacific from 1940 to 1946. He was in training at Hickam Field, Hawaii, when the Japanese bombed Pearl Harbor. He said the displays bring back memories for him, but hopes they will give something to younger generations as well. "This is great and is incredibly educational," Baker said. "I hope they bring all the school kids here to see what aviation is all about. School kids today don't really know much about the history of flying." Retired Col. Bob Shawn, a B-29 pilot with nearly 18,000 hours in the cockpit during his 30-year career, agreed with Baker. "The kids need to learn about World War II as well," Shawn said. He wore an early Army Air Corps uniform to the event. "Some of the schoolbooks today have only a few pages on that war. I don't understand how they can reduce a war that took six years to fight into just a few pages." It is to men like Shawn, Baker and Sanders that America owes a debt of gratitude for the freedom we enjoy, Myers told the crowd of nearly 4,000 attendees. "In 100 years, in only one century, we've come from the Wright Flyer to this airplane before us," Myers said, pointing to the experimental version of the Joint Strike Fighter on display. "(We've gone) from canvas and hope, to stealth and a little magic. It's all because brave American military aviators, brave Americans who risked their lives and limb, (who) slipped the surly bonds of Earth risking all to keep America free." Myers also acknowledged the contributions of modern-day aviators who were also in the audience. "We must remember that American aviators and the rest of our armed forces and our coalition partners are engaged in the war on terror," Myers said. "I am very proud of those defending liberty today with courage and skill, in today's armed forces. It was the dedication and vision and determination of America's aviation veterans that really made contributions to America's freedom in the last century right through to today. That spirit lives on in one continuum as we fight this war on terrorism." The center opens to the public Dec. 15. The opening coincides with celebrations marking the 100-year anniversary of the first powered flight near Kitty Hawk, N.C.